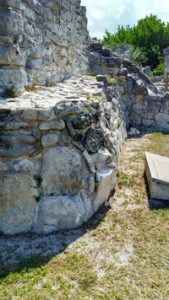 To further a quest, I recently traveled to the Yucatan to seek the mysterious Kulkulkan, the Feathered Serpent. In Mesoamerican traditions, the Feathered Serpent is a teacher and central deity. Some credit the god with civilization – he taught the people agriculture, arts and science (1). He was also known as the “god of wind” and is found in other Mesoamerican traditions dating back to the Olmec. According to Aztecs, the Feathered Serpent is said to have left Mexico on a “raft of serpents” but promises to return one day. La Venta Stele 19 from the Olmec civilization (Photo by George & Audrey Delange). Riding the snake: Ancient astronaut theorists have speculated the snake represents a flying vehicle (for example, an alien space-craft), while other researchers see the snake as a “vision serpent”, a god that communicates with humans via altered states of consciousness. I wish to explore the idea that non-human intelligences has influenced the development of our more advanced civilizations. This does not mean I think Mayans or any other indigenous group are incapable of developing their own cultural achievements, as I am sure “the people” accomplished much. Rather, since the ancient Mesoamericans believed a god known as the “Feathered Serpent” helped them, I want to understand how and why. I expected the Mayan coast to be the best place to find the wind god. The refreshing breeze off the sea seems to reaffirm the pledge of return. 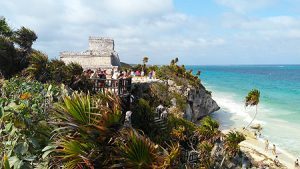 There is more to the Yucatan and Mexico than windy beaches and spicy food. If you allow yourself to wander, you become aware of some glaring and paradoxical features. Mexico is a land of contrast – the place where you see folk-made statues of the laughing and skeletal ‘La Catrina’ standing next to churches and remnants of Spanish colonialism. You will see opposite extremes like luxurious modern homes towering over beggars in the street. If you are from an English-speaking country, you might become fascinated by the Latino culture. My Spanish is poor but that did not stop me from booking outside of the hotel zone. 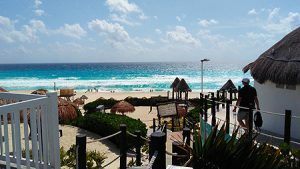 I didn’t want to stay in the more Vegas-like areas of Cancun as the resorts lack Mexican culture and not to mention, are far too expensive (often in the $1400 and up per person / week range) for the budget traveler! I stayed in a downtown Cancun hotel and found it not only economical but perfectly situated near the bus station (aka The “ADO”). Try a “Hotel & Plane” search for an inexpensive package deal to Cancun at one of the major booking sites (Travelocity, Expedia, etc). I traveled from Toronto and could have saved a little by sleeping in a hostel but after doing some of that in earlier days, I have come to value the privacy of a hotel room. Rooms can be had for $20-$50 a night. I chose a Mexican 3-star, which would be like a 2-star in G-7 nations. There was plenty of closet space for my clothing and nothing went missing. I slept and dreamt well as the “beat-up” old bed was comfortable enough. Bed sheets and towels were changed regularly; just remember to tip the maid! The “hot” water was mostly hot; sometimes cold. I didn’t see a cockroach the entire time! Within walking distance of my hotel was a charming amusement park / market place called Parque de Las Palapas where you can order authentic Mexican cuisine for a fraction of hotel zone prices. It is sweet to watch the Mexicans gather there with family and relax after a long day. Kids ride around in little bumper cars parents can rent. Young couples walk by hand in hand and it is especially colorful here after dark as the whole place lights up – even the bumper cars have headlights! A cool breeze filters through the park grounds and musicians come to play and showcase their songs. You receive free entertainment while you eat! Some of the artists are so good you can’t help but support them by dropping a few pesos into their hat or purchasing a CD. Thanks to the park, my meals were very affordable and delicious. Due to the aforementioned paradox, I recommend bringing pro-biotics and Rolaids tablets just in case your stomach does not agree. I tried the hotel restaurant but found the eggs a little crunchy for my taste and the staff seemed very uneasy with my poor Spanish (Hint: Take a course in Spanish before traveling to Mexico!). If you really need a more traditional “cheap” breakfast, there is a corporate McDonald’s monstrosity only a few blocks away and not far from the bus station. Just follow the golden arches, they are visible for miles! I often visited the large grocery store on the corner. It has pretty much everything you find in G-7 grocery stores. The baked goods are somehow more extravagant than what you find in the North. If you really want to go cheap, you could shop and buy all of your food here, but be forewarned, having a lot of groceries in your hotel room might attract pests. Each day I was in town, I took the “R1” city bus to the government beaches in the hotel zone for less than dollar. I went to see the ruins at El Rey on my first full day. Compared to other Yucatan sites, these are unspectacular but being from a country that has few ancient monuments, I was bedazzled just the same! Although El Rey has “late” Mayan ruins (dating 1200-1500 CE according to the plaques), I saw patterns that would repeat at other Mayan sites. The signs gave an English explanation and you get the idea the Mayans devoted a lot of time & energy to their religion – temples are everywhere! The Mayan buildings often seemed to be platforms built on top of other platforms. I spotted a crumbling series of platforms at the end of the main boulevard which turned out to be the central pyramid of the site. I thought it was interesting the pyramid had rounded corners at the bottom but subsequent layers were squared and later learned this might be symbolic of the divinity involved in measurement and movement (6). Rounded corners are said to be rare in Mayan architecture but I would later see them in both Chichen Itza and Tulum. I wondered if the rounded corner allowed for the smooth flow of wind around the temple. The aerodynamic round corners might exist to allow for the unimpeded progress of the wind god during rituals. It also seems to imitate the coiled body of the snake god. The base of the dilapidated pyramid at El Rey. Rounded corners can be found in Mayan coastal ruins. Looking at the diagrams of the temples in their prime, I realized the fallen bricks and stone were just the leftover skeleton of a highly organized civilization. There was existence of patchwork and repairs by the later Maya that did not look so perfect but also had little to do with the original planners and builders. By midday the heat and humidity are overwhelming and I needed to cool off. Across the street from the ruins is an incredible public beach known as “Playa Delfines”. The water was a little rough due to high winds and I could do little more than wade in up to my knees. My feet sank wonderfully deep into the cool sand bar. It might feel therapeutic for someone escaping the Canadian Winter but probably felt like quicksand to an ancient mariner wading ashore. 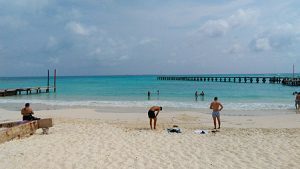 The Cancun beach I ended up using was near a Starbucks where I could change out of damp trunks after a swim and enjoy a hot cup of coffee in the air-conditioned store. In the mornings, I practically had the beach to myself! I could sit, meditate and try to remote view the Feathered Serpent’s return. My “hidden” beach in the Hotel Zone. The ADO station was within walking distance from the hotel and from here I was able to travel onward to Playa Del Carmen and Tulum. The ADO is an air-conditioned and comfortable bus line. If you are feeling extra adventurous you could do day-trips to Valladolid for downtown cenote swims, or spend a few nights in beautiful Merida. The colonial towns are charming and candy for the eyes. I regret not using the ADO for a direct trip to Chichen Itza. 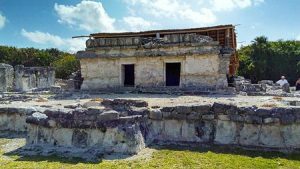 The tour excursion I hired wasn’t too expensive (about $45 USD from Cancun), they picked me up at my downtown hotel and the guide was entertaining but after we visited a market, a cenote and had lunch, we were only allotted a few hours to visit the ruins. If the whole point of taking the tour was to see the ruins, you will feel rushed and short-changed, believe me! After only a half hour of walking around on my own, angry-looking park employees began blowing whistles and pointing towards the exit. There was zero time to visit the Observatory. What really grabs you about Chichen Itza, is the main pyramid. The Castillo (Castle) is devoted to the Mayan god Kukulkan (the Mayan version of the feathered serpent), and dominates the main plaza. It’s larger-than-life presence is wonderful to behold in person, more so than words can relate. You really get the feeling you are at “the center of it all”! The pyramid is built on a cenote and has a “vortex” kind of feel and I noticed the corners at the base were not sharp angles but slightly rounded. Unlike the other ruins I visited many carvings are view-able on outer wall. You see many “snake” images. The tour guide also performed a neat trick by clapping his hands and gaining an echo from the pyramid that sounded like the chirp of a quetzal bird. Amazing acoustics are also present in the ball court, where teams are said to have played a game to see who lived or died. Speaking with tourists, I noticed my voice was dramatically amplified and somehow more “present” in the ball court. There seemed to be an intense, heightened awareness as to what you were doing and saying. An Anthropomorphized Feathered Serpent at the Chichen Itza Ballcourt. 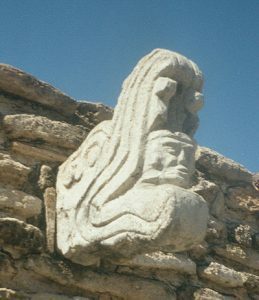 The decorative carving of a man emerging from the mouth of serpent can be found here, bringing to mind the Olmec Stele 19 (see image near top of the article) from La Venta. Some theorists believe the snake and human images are portraying people communing with the god (5) while others, like the ancient alien proponents, believe the feathered serpent represents a flying vehicle – there do exist some strange UFO accounts involving flying reptilian craft (see footnote 4 below). Mayan mythology describes serpents as vehicles used by the sun and stars to cross space (2). I have long thought some UFOs might be traversing a sort of “psychic space” or consciousness dimension. “The Mexican mathematician Hector M Calderon says that a people as sophisiticated mathematically as the Maya would have had to incorporate its theogenic concepts into actual numbers… (the) number 2 was Gucumatz or Kukulkan or Quetzocoatl, the airy plumed serpent, the feathered part of which represented the spirtiual and abstract, whereas the snake was the earthy and palpable. It represented the spiritual-matter duality of the universe” (3). Chichen Itza was once the center of a Mayan trading empire that covered much of the coast and stretched into the reaches of the Yucatan. Present-day vendors are not as aggressive as some travel reviews suggest. You need only say, “no gracias” and be on your way. They will often try to grab your attention by shouting “one dollar” but prices might increase when you show interest. Be prepared to haggle! On the way back, the bus stopped at Valladoid – a colonial city with a large square and park. I stretched my legs here and met some locals. Cenotes are found within the town, making this a favorite inland city for tourists. Day-trips from Cancun are possible but I would recommend staying over night. After exploring some of Cancun, I took the bus to Playa Del Carmen and rented a room near the bus station. Playa Carmen has an entire avenue blocked off from traffic and it’s an enjoyable walk. Rock bands play in open air bars while beautiful women wearing the latest fashions wander through the maze of people. You will be besieged by salespeople offering massages, recreational drugs and various excursion tours. Again, I normally say “no gracais” and keep walking but one soul managed to grab my attention and I followed him into his shop. I believe his name was “Charlie” (or something like that). This man had an unusually round-shaped head, kind of like an old-style light-bulb and I respectfully wonder if his Mother had used cranial deformation techniques (see http://thejns.org/doi/full/10.3171/2010.9.FOCUS10200 for info on cranial deformation and the Maya). He offered the same sort of bric-o-brac everyone else was selling and I wasn’t interested in any souvenirs but then showed me his “work”. This was a kind of hide material with designs and “Charlie” explained it took some time and devotion to make. 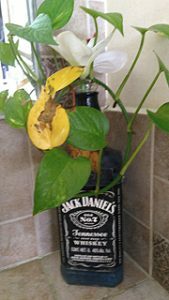 It wasn’t my taste but I was still impressed with his craft and complimented his efforts. Charlie told me he was a full-blooded Mayan and that most of the people in Playa Del Carmen were only part Indian. Looking at the man, I could believe it but wasn’t in the mood to buy and wanted to be on my way. I told him I would think about it. 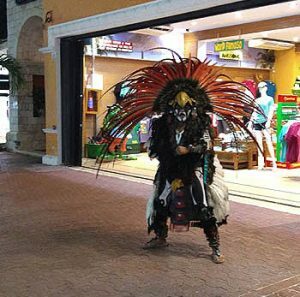 Be Forewarned: In Playa Del Carmen, salespeople come at you from everywhere! There was little time for deep sea diving so I visited the Playa Del Carmen aquarium. It is a small yet excellent facility located upstairs at a mall (Calle 14 Nte 148). Staff are friendly and the manager is a good man. The aquarium is involved in a project to return coral to Mexican reefs and you can witness some of these amazing animals in a large viewing tank. Tiger sharks swim above your head in one section and deep water jellyfish glow magnificently in another. There are larger aquariums in the world but this one is well worth the price. I am not so impressed with the Playa Carmen beaches. You have to travel quite far down the avenue (past Calle 40 or so) to find the “nice” beach but even this tree-lined, picturesque area has smelly seaweed and only a narrow dry bit of sand. 1 “Mexican and Central American Indian Folklore” by George M Foster, Funk & Wagnalls Standard Dictionary of Folklore, Mythology, and Legend, 1972, New York. Page 712. 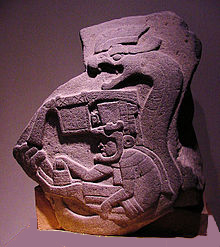 2 See https://en.wikipedia.org/wiki/Vision_Serpent, 2nd paragraph which, as of this writing, reads: “Maya mythology describes serpents as being the vehicles by which celestial bodies, such as the sun and stars, cross the heavens”. 3 “Mysteries of the Mexican Pyramids” by Peter Tompkins, Harper & Row, 1976, New York, Pages 283-284. Q: Could you describe the object you saw? A: To me, it looked like a giant lizard with wings, and it was little over one and a half times the size of the road width. Q: Did the object look foreign or like something we could build here on Earth? A: I don’t think it was like anything we could build. That’s how strange it looked and that’s what scared me. It didn’t look like anything I had seen before, except maybe the lizard part. That’s the only thing I could relate to it. Q: Did it have wings? A: Yes it did. It looked like frog legs spread out, with that gap in them. Q: Do you remember seeing engines? A: I don’t remember anything like that but maybe on the back there was something. It was a round thing. Q: What shape was the body? “Many have attempted to explain the manifestation of the Vision Serpent in association with Maya bloodletting. One conclusion is “that massive blood loss causes the brain to release an abundance of natural endorphins, which are chemically related to opiates. As the body goes into shock, a hallucinatory vision occurs.” Once the actual bloodletting was over, the blood soaked ceremonial papers were burned, releasing a column of smoke. The smoke provided the perfect medium for the Vision Serpent to appear. Every major political or religious event involved bloodletting because it provided a medium by which the gods could be called upon to witness and actually participate in the ceremony… Remnants of the Vision Serpent have survived until modern times. Around 1930, J.E.S. Thompson noted in San Antonio, Belize, that the Q’eqchi’ Maya still performed a ritual very similar to the vision quest of the classic Maya, although in a different context. The ritual marked the initiation of a new shaman for the village. The participant came into direct contact with a giant serpent, Ochan (Och-Kan). It was through this experience that he completed his initiation rites and gained the knowledge that is needed to become a powerful shaman”. 6 Ibid. “Mysteries of the Mexican Pyramids” by Peter Thompkins, Harper & Row, New York 1976, Page 282, where it says, “According to Martinez (the linguist and philogist Domingo Martinez), the Maya came to the mathematical certainty of the existence of a cosmic consciousness which they named ‘Hunab Ku”, sole dispenser of measurement and movement, to whom they attributed the mathematical structuring of the universe. The divinity they represented by a circle in which was inscribed a square”.